It went down, on the track and off, at the Penn Relay Carnival in Philadelphia this weekend. The 119 year-old track-and-field meet was not just a sporting event, but also an actual carnival where Caribbean-Americans came to show pride in their countries and to sample delicious treats, like the curry-based Trinidadian Roti. But make no mistake, the business commenced on the track. The crème de la crème of USA Track & Field and countries around the world came to compete. Jamaica’s Shelly-Ann Fraser-Pryce was in the house; so was the four-time Olympic gold medalist, Allyson Felix. Not competing were Carmelita Jeter and Sanya Richards-Ross, both of whom graced us with their presence, but more in high-style than substance (the two were literally sidetracked with injuries, their shiny manes flowing as they cheered their teammates on). 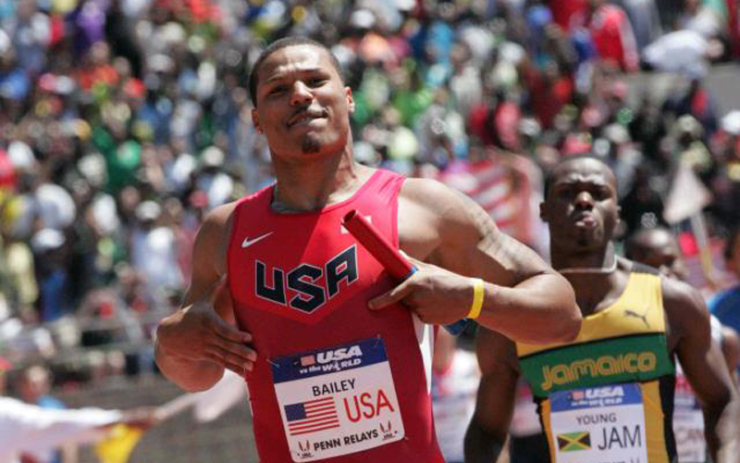 The United States got off to a good start when Ryan Bailey and his teammates, Mike Rodgers, Justin Gatlin and Doc Patton – who ran a blazing third leg to put it out of reach – bested the rest of the world with a modest time of 38.26. A different outcome could have been expected if Yohan Blake and Usain Bolt, both obviously missing from the runner-up Jamaican team, had been there. On the women’s side, the “Pocket Rocket,” Jamaica’s Shelly-Ann Fraser-Pryce was not to be outdone in the USA vs. the World Women 4×100 event. Fraser-Pryce reached for the baton before her fellow anchor from the USA, Jenebah Tarmoh – though Tarmoh started her drive to the finish with slightly less curve to run than Fraser-Pryce in the outside lane. The two-time 100 meter Olympic gold medalist stayed strong, dug in, and showed why she has the hardware. “When I got that stick, I was like this was it. There was no way I was going to let her catch me today. 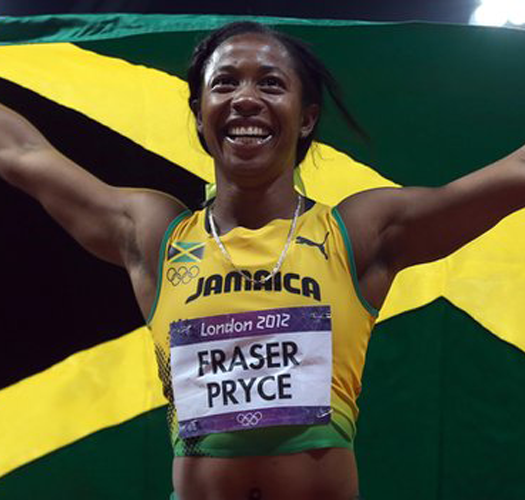 Because we wanted it and we got it, whewww…” is what Fraser-Pryce jubilantly told NBC’s Lewis Johnson. The Jamaican team posted a time of 42.42. While the crowd mostly focused on the battle between Fraser-Pryce and Tarmoh, there was another place-change between USA Red and USA Blue, anchored by former Texas A&M Aggie, Porscha Lucas with a time of 42.65 (1/100th of second faster than USA Red’s 42.66). Missing from the race were Jamaica’s Veronica Campbell-Brown and America’s Carmelita Jeter, who is out with a hamstring injury. Quite possibly, the relay-race of the day was the USA vs. the World Women 4×400 event, where the Americans held on for a photo-finish, leaving 2/100th of a second between them and Great Britain. Francena McCorory – who put in a gutsy performance – anchored the US women. The Brits’ anchor, 400 meter-hurdler Perri Shakes-Drayton, accelerated and threatened to pass McCorory down the final straight-away, but, the powerful McCorory fought for the line with mental determination and the laws of physics – driving with force and constant motion to stay in 400 meter form. The US clocked in at a time of 3:22.66. Team USA’s men also won the USA vs. the World Men 4×400 event in a time of 3:00.91. That relay team consisted of Torrin Lawrence, Bershawn Jackson, Tony McQuay, and Manteo Mitchell, who looks to have fully recovered from breaking his left fibula mid-way through the same race at the Olympic games in London last year. The Americans won the medal count with 4 wins; Jamaica and Ethiopia, had one first-place finish each, with Ethiopia’s coming from the USA vs. the World Men’s Distance Medley event. In a post Olympic year, the Penn Relays proves that the sport of track-and-field is as healthy as ever, with over a century of engaged fans ready for a showdown!